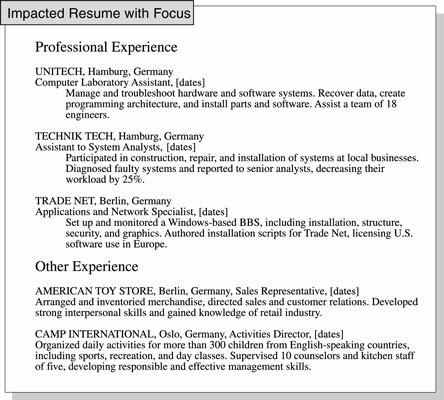 Focus your resume on job experience that’s relevant to a specific position to improve your chances of getting that job. Having relevant job experience is always a big plus in employers’ eyes. If you have too many jobs in your background, you can structure your resume to highlight pertinent job positions and omit or deemphasize others. An unfocused resume or job history may indicate to others that you lack commitment. It’s a reason not to hire you. Focus your resume to draw attention to your relevant job experience. When your resume looks as though it will collapse under the weight of a mishmash of jobs unconnected to your present target, you can eliminate your previous trivial pursuits. Group the consequential jobs under a heading that says something like Relevant Work Experience Summary or Professional Experience. What if this approach solves one problem — the busy resume — but creates another, such as a huge, gaping black hole where you removed inconsequential jobs? Create a second work history section that covers those holes, labeling it Other Experience. List the temporary services company as the employer. You choose one job title that covers most of your assignments. Identify specific assignments under the main title. Give the dates in years next to the temporary services firm, skipping dates for each assignment (as shown below). Improve focus by grouping temporary job experience under one major title. What if you work for several temporary services at the same time? The simple answer is that you use the same technique of dating your work history for the temporary service firms, not for the individual assignments. This dating technique is a statement of fact; you legally are an employee of the temporary services firm, not of the company that pays for your temporary services. When excess jobs or focus isn’t a problem, you may choose an alternative presentation for a series of short-term jobs. 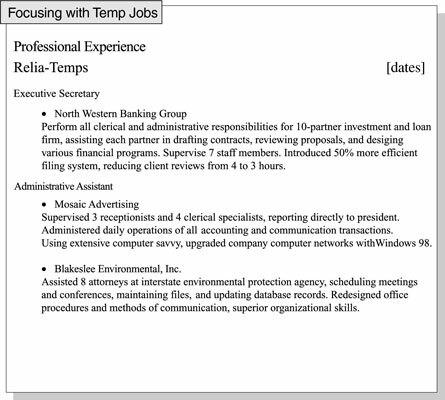 The alternative doesn’t mention the staffing firm(s) but only the names of the companies where you worked.